Turrets play a very important role in Tanki Online. The type of gun you choose will strongly affect your playing style, whether it is aggressive, close-range attacks, firing from protected positions, or supporting your team-mates. In addition, your weapon of choice can be upgraded. All guns have four modifications — M0 to M3 — from weakest to strongest. The price of lower modifications isn't high so you can try the most popular tactics at junior ranks without having to spend a large number of crystals. However, it's impossible to get everything you want at once. 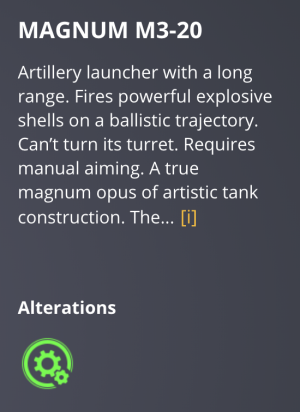 Particular turrets and modifications can be purchased only at a certain rank. Choosing the right turret is only part of your success. You also need to choose a hull. The good news is that there are plenty of those in Tanki Online - from the lightest and fastest to the heaviest and most armoured. Like the turrets, each hull also has four modifications, from M0 to M3. You can try the most popular tactics on junior ranks without having to spend a large amount of crystals. But it’s impossible to get everything you want at once. Particular hulls and modifications can only be purchased at a certain rank. You can further personalize your tank using a wide variety of paints: there are common paints and rare, unique paints that are used by representatives of the game’s administration, tournament winners, and other players who have gained special recognition for their contributions to the project. Modules are special elements that can be equipped on your tank, designed to protect it from the enemy weapons. Visually, modules do not appear on the tank nor show any effect, however, if you press and hold the R key while in battle, you can see which modules and what protections are used by other players that are in the battle with you. During a battle, in chat you will occasionally see words such as “Drugs!” or “Drugger!”. These words are in no way related to the use of illegal substances. They simply refer to players who are using Supplies. These items from the garage allow you to temporarily boost a particular characteristic of your tank while in battle, or place an explosive mine in the battlefield. Crystals are the game's unit of currency. Currently, crystals are used to buy and upgrade hulls, turrets and modules. Supplies, paints, passes, gifts and the occasional surprise items - often associated with holidays or special days in the game - can also be bought with crystals. There are several ways to get crystals. Drones can be bought for crystals in the 'Drones' section of the Garage, or they can be bought as a Product Kit for real money in the Shop. Containers are items which have unknown contents inside them. Upon opening the box, players can receive something from a selection of items. The contents will vary all the way from supplies to rare paints and more. Containers can be obtained from mission chains, catching Black Boxes, winning them in Contests, or purchasing them in the Shop. — Select one of the eight sections that you can find in your Garage. — Drag the scrollbar to find the desired item, and then click on it. — In the Information section you will find a description of the selected item, as well as the Preview button (for Paints only) and the Buy button that you need to click on. Note: If the buy button is disabled, it either means that you do not have enough crystals, or you do not have the minimum required rank to purchase the selected item. If you do not have enough crystals, the button will still read "Buy". You can click on it to purchase the remaining amount of crystals using one of the payment services. If the item is not available due to your rank, its icon will be greyed out. — You can confirm or cancel the purchase in the window that appears after you click Buy. If the purchase is successful, the item will instantly become part of your Garage. This page was last modified on 18 July 2018, at 22:51. This page has been accessed 172,671 times.